In the animal kingdom, no rivalry has ever been as fierce or as famous as that of mankind’s two favourite pets: cats and dogs. So what happens when you arm these furry factions with an arsenal of Japanese weaponry? 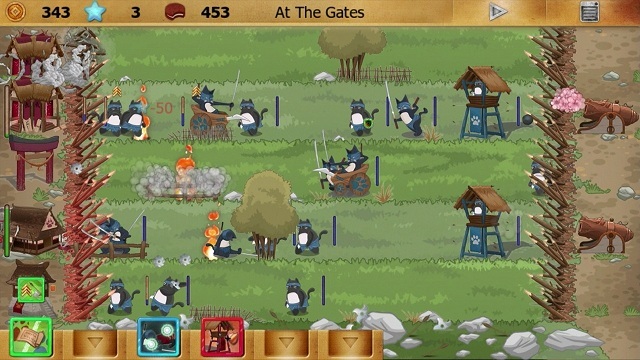 You get Ninja Cats Vs Samurai Dogs, a take on the popular Plants Vs Zombies, albeit with a little more depth. As hinted by the name, you’re given the opportunity to play as the stealthy Ninja Cats, or the fearsome Samurai Dogs – both factions feature the same classes of unit, the only differences are purely aesthetic. Once you’ve picked what side you want to command, you’re taken to a world map. In the initial free download, nine missions are available, but an in-App purchase (currently 69p) adds the rest of the game’s missions. The initial couple of missions will take you through the basics of the game. Essentially, you have five horizontal lanes on screen, your army starts on the left-hand side, with your foes on the right. You must erect buildings at the beginning of each lane to be able to create cards that act as your units and power-ups, as well as other buildings that provide you with resources. These structures are protected by a fence, which you must defend while trying to attack your opponent. When a unit card is deployed, your warrior will travel from left to right, attacking any enemy that’s on their path. Your aim is to get to the end of each path, destroy your opponents walls and buildings to occupy their lane – capture three lanes and the win is yours. Meanwhile, the AI is trying to do the same to you. Several units are at your disposal, ranging from the close-quarter infantry, the ranged attacks of the archers and the speed of the cavalry. In a Rock-Paper-Scissors fashion, all units have an opposing unit they’re stronger than, and another they’re weaker than (for example, cavalry units are great against archers, but rubbish against infantry). Winning battles will earn Experience to gain levels, plus various coloured orbs (red, green and blue). Levels and orbs will allow you to purchase new abilities and units. These abilities are split into three branches on a skill tree: Might (Red), which are your offensive units; Martial (Green), which offer buffs; and Magic (Blue), which gives you various offensive and defensive spells. While the in-game tutorial explains the initial stages quite well, it doesn’t really try to explain some of the Martial and Magic abilities very well – I was never sure how to best use these abilities to their full potential. In battle, you can press and hold over any building, unit, or card to see what they do, but it would have been nice to have this information outside of battle. Luckily, on the map screen there is a button that takes you to this game’s forums that offer some great advice and guides for those who are struggling. And you will struggle, because some of the battles in this game are pretty darn tough, especially when the game doesn’t really tell you how to deal with some of the advanced abilities that the enemy will throw at you. It can be incredibly frustrating when the AI starts throwing magic spells at you that instantly kill your units, while the game gives you no indication on how to avoid or even defend against these attacks. 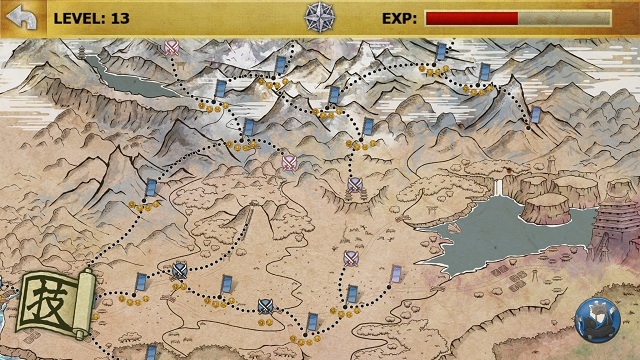 Luckily, your path on the world map branches off, giving you multiple missions to work on even if you’re stuck. There were times when I really struggled with all of the available missions though, and I really needed some more advice on what to do next. In addition to normal battles, there are also Skirmishes that give you a set number of cards which you must use effectively to defeat every wave of enemy that attacks. There are also side missions that involve performing various tasks such as collecting a certain number of orbs, or finishing certain levels. Completion will allow you to take part in a battle to earn Artifacts that give you new abilities. For instance, the first Artifact (Memory Crystal) will allow you to re-spec your skills, which is essential for when you’re truly stuck and need to come up with a new strategy. The battles themselves are pretty intense at times; lots of plate-spinning while you defend multiple lanes trying to mount some sort of offensive. You’re able to pick the cards that your buildings create, but it can still take a while for units to arrive – a lot of the time it feels too long, especially when the enemy is attacking your wall from multiple lanes. But there is a great sense of achievement when you begin to find the best ways of deploying your units, and coming up with new strategies. It would have been nice if the two factions had units that acted differently, instead of just looking different, but there’s still plenty of depth and content here, regardless. 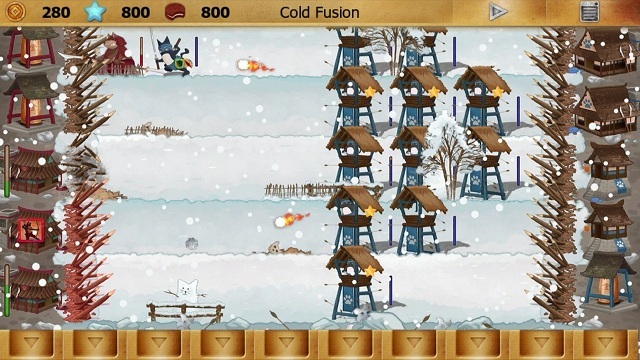 With a game that features Ninjas and Samurai, it makes sense for the presentation to have a distinct Japanese influence, which this game provides in spades. You’ve got your ink-drawn characters (think Okami) that also retain a certain cartoony style that’s very effective, along with a very authentic sounding soundtrack which sets the scene very well. It’s always nice to see a game that eschews the usual trends (if I see another mobile game with zombies, I’ll go mad), and here the presentation is well thought out and complements the gameplay incredibly well. VERDICT: Challenging yet rewarding, this is a game that is at its best when the player is experimental with their strategies. While I could have done with the tutorial being a little bit more helpful in regard to some of the abilities and opponent attacks, this is a very enjoyable strategy game. The free download gives you nine levels to play, which is more than enough to decide if you like this game enough to splash out on the currently minimal IAP fees.